Thanks to a seven-run second inning that supplied all of their offense, the Buffalo Bisons defeated the Toledo Mud Hens by a score of 7-5 last night. With the win, the Herd stayed 3.5 games back of Rochester in the North division but pulled to within 2.5 games behind Pawtucket in the Wild Card standings. Here are some notes on a few Bisons players, including a struggling outfielder that had a standout performance in the Herd’s win last night. To say that the 2013 season has been frustrating for Gose would be an understatement. He drew 14 walks in his first 23 games en route to a .370 on-base percentage, but after that, the strikeouts started to climb and the walks started to fall. Called up by the Blue Jays near the end of May for 13 games, Gose hit .305 and managed a .776 OPS before being sent back down to Buffalo on June 6. The 22-year-old has continued to struggle since rejoining the Bisons, having managed just a .229 average and .585 OPS in 47 games prior to Monday night. But Monday night’s game was a totally different story. Facing the Toledo Mud Hens on the road and batting second, Gose went 3-for-5 with a pair of standup triples and three RBI. His first triple in the second inning came on an 0-1 pitch and cleared the bases, igniting a seven-run frame for the Herd. His second triple came in the fourth inning when, more impressively, he was down 0-2 with two out. That’s three triples in three games now for Gose, who has a hit in seven of his last 10 games. It was the fourth time he’s managed three hits in a game this season, and the first time he’s done so in over a month. The three RBI in the game were also a season high. On top of his big day at the plate, Gose was involved in the final play of the game when threw out Toledo shortstop Argenis Diaz at home plate for his team-leading 14th outfield assist. It’s only one game, but hopefully Gose can get a roll and enjoy a few more of these nights in the final month of the season. Activated from the 7-day disabled list on July 22, Sierra has gone 9-for-32 (.281) at the plate with hits in six of the eight games he’s played in since returning. He’s also gone 3-for-4 in stolen base attempts, thanks to swiping a bag in each of his first three games since coming off the DL. Weighing in at 230 pounds, Sierra’s muscular frame doesn’t fit the traditional physical profile of a base stealer. 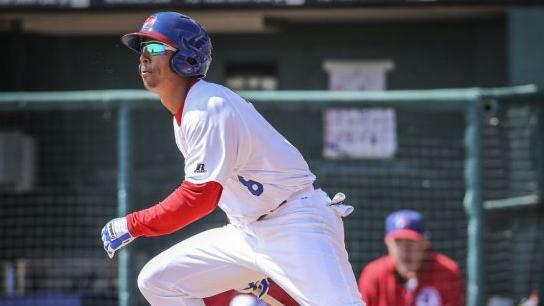 But following the Bisons’ release of outfielder Eugenio Velez—who led the team with 21 stolen bases—last week, Sierra now quietly ranks third on the club with 10 swipes in 13 chances. In fact, that’s only two less than Anthony Gose, and in 11 fewer chances. Having managed Sierra in Las Vegas last year in addition to this year in Buffalo, Bisons manager Marty Brown knows exactly how to use Sierra when he needs to. But just because Sierra can steal a few bases doesn’t mean he has the green light. Victim of the fact he could be optioned to Triple-A without having to clear waivers, Wagner was sent to Buffalo by the Blue Jays on July 21 following a 20-game stint in the majors. Wagner took the move in stride, and after striking out the only batter he faced on July 23, he struck out the side swinging the following night in a perfect ninth inning to record his 14th save of the season. He’s recorded two more saves in as many chances since then, and it’s safe to say his manager is glad to have him anchoring the back end of the bullpen once again. After his scoreless 1 1/3 innings last night, Wagner lowered his Triple-A ERA this season to 0.76, and hasn’t given up an earned run in a Bisons uniform since April 14 — the only time in 23 outings this season that he’s given up a run. That’s the thing with MLB and and pro sports. They overpay for someone then someone that is doing the job better has to be sent down. He did a great job in the majors and people have noticed. I see him in the league next year.